Hide Cables Behind Your Skirting Boards! If you are installing new skirting boards it makes sense to create a cleaner, clutter–free interior by running any visible cables (telephone, Ethernet, audio etc.) behind your new skirting. Our cable-tidy skirting boards allow you to do just that! 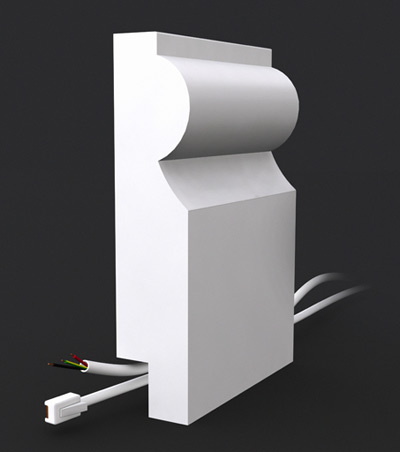 This is a great alternative to trunking, which as well as being an additional cost can be quite an unattractive solution! By hiding your cables behind your skirting boards, you get all the benefits of channelling into your plaster without having the extra work, expense or mess. What’s more, if you need to access the wires at any time you won’t end up with a bill to re-plaster your walls! When you have chosen the skirting board that you need, you can select ‘cable rebate’ from the drop down menu (shown) and when we receive your order we will manufacture your skirting with a 20mm recess (rebate) in the back of the board. When this is installed flat against your wall, a small hollow chamber will be created that is perfect for cable management. Simply run any wires you wish to hide from view through the chamber and they will remain sight-unseen. 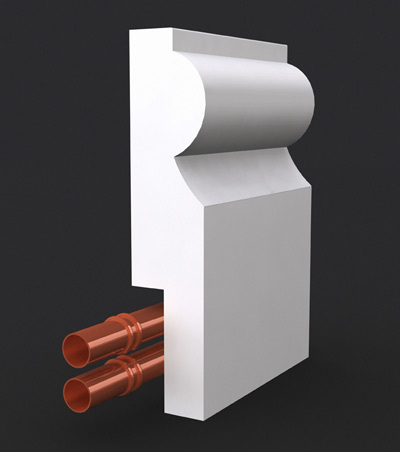 We are seeing a rapid increase in enquiries for MDF skirting boa rds that will fit over central heating pipes. The good news is that for a very small additional fee of only £2.00 per length, we can cut a recess in the back of your skirting board to allow you to hide any visible pipework behind it. The pipe rebate (or recess) is cut to a standard size of 40mm high, which is enough for the vast majority of cases. If you need to alter the height that is absolutely no problem- simply give us a call and discuss your requirements with one of our sales representatives and they will be certain to work out a solution for you. To make sure the skirting boards remain strong and durable, we tend to leave a minimum of 6mm of board once the rebate has been created. Please bear this in mind when deciding on the thickness of the skirting board you are looking to order. How To Order Pipe Rebate Skirting? Once you have selected the skirting board you want for your project, simply select ‘pipe rebate’ from the rebate drop down menu on the product page, and when you place your order we will know to manufacture a pipe rebate in the back of your skirting. If you have any concerns at all, please do give us a call and we will talk through your order with you to guarantee it is correct and exactly what you need.